Media | Pledge to Resist! 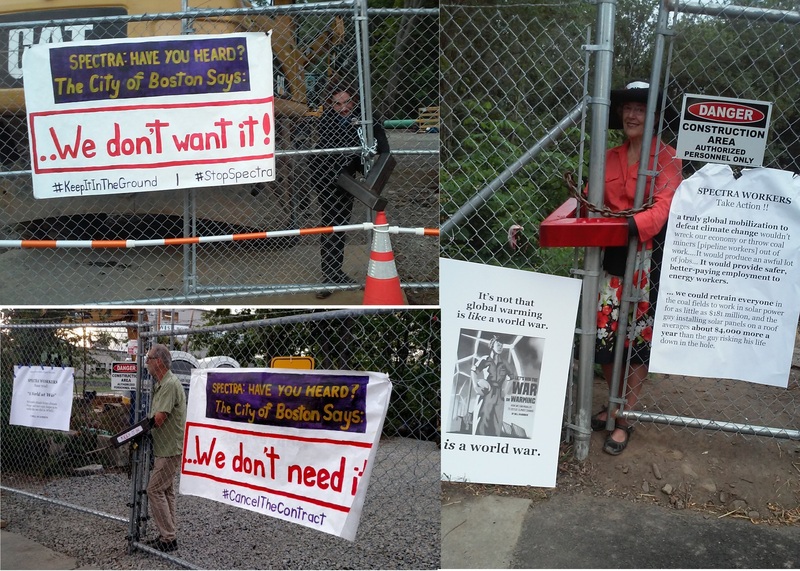 Updated: BOSTON – Three Boston residents protested pipeline construction Thursday by locking themselves to the entrance gate of the construction site on Grove Street. Other protesters held signs in front of the construction. The protesters were pushing back against the West Roxbury Fracked Gas Lateral Pipeline, which is being constructed by Spectra Energy. WEST ROXBURY (CBS) – Nearly a dozen people broke into the natural gas pipeline work site in West Roxbury Thursday morning in an attempt to disrupt construction. Three people locked themselves to the entrance gates of the site’s metering and regulation station. Eight others stood in the dug up street where construction was taking place. Karenna Gore and fellow protesters go to pretrial for pipeline protest Boston Delegation files appeal to FERC Last week, six protesters from the June 30 protest of the West Roxbury Lateral Pipeline (WRLP), including Karenna Gore, attended their first pretrial in the case after refusing to take a plea deal on July 1. See Page 3 below for our “Why Civil Disobedience In West Roxbury” Ad! Several people were arrested after locking and gluing themselves together at 9:50 a.m. on Saturday to block two construction sites of Spectra Energy’s West Roxbury Lateral gas pipeline, according to Alyssa Lee of Resist the West Roxbury Lateral Pipeline.Lee said six people were arrested, however, Boston Police said four were arrested in the area of 2365 Centre St., West Roxbury. On June 29, I was one of 23 people arrested for nonviolent resistance to a pipeline being built under the streets of West Roxbury. Owned by a Texas-based corporation called Spectra Energy, the West Roxbury Lateral would use high pressure to push fracked natural gas approximately 5 miles of a journey that begins in the Marcellus Shale in Pennsylvania. A number of protesters were arrested while rallying against the construction of a gas pipeline in West Roxbury on Thursday, police and demonstrators said. About 90 people went to the site on Grove Street Thursday morning, held signs, and chanted in opposition to the West Roxbury Lateral pipeline, which is being built by Spectra Energy. Opponents of the West Roxbury Lateral Pipeline (WRLP) hit the construction site four times this week and 30 people were arrested blocking the site. At each event, more than 100 residents, climate activists and pipeline opponents came out to support the arrestees each time. Protesters went out last Thursday, last Saturday, Tuesday and Wednesday. On Wednesday, 23 people were arrested protesting Spectra Energy’s fracked gas pipeline in West Roxbury, Massachusetts. Longtime climate activist Tim DeChristopher was one of about 30 people who ventured onto the Spectra pipeline construction site in an attempt to nonviolently stop work. Some 16 clergy members from across the Boston area were arrested this morning on Grove Street in West Roxbury, where they briefly blocked construction work on a high-pressure natural-gas pipeline to protest what they said was an unneeded pipe that could blow up the neighborhood. Updated: 05/03/2016 06:36:06 PM EDT By Katie Lannan State House News Service BOSTON — The fight against natural-gas pipelines in Massachusetts has not subsided in the wake of Kinder Morgan’s suspension of work on its controversial $3.3 billion Northeast Energy Direct project. Following the arrest of more protesters and the resumption of street construction on the high-pressure natural gas pipeline through West Roxbury and Dedham, two opponents air concerns: Paul Horn and Nathan Phillips. Interview for BNN News. Aired May 2, 2016. West Roxbury hosts hundreds protesting pipeline It was damp and raining on Saturday morning, but that didn’t stop almost 300 residents from coming out to protest the West Roxbury Lateral Pipeline (WRLP). “We don’t want it, we don’t need it, shut it down!” said West Roxbury resident Mary Boyle as she led the crowd in protest. Protesters had planned to get arrested today to protest the construction of a high-pressure natural-gas transfer station in West Roxbury, but the company building it decided not to do any work today – despite what it had told nearby residents in fliers. Updated: WEST ROXBURY, Mass. – Residents that describe a natural gas pipeline proposal as unsafe and unnecessary took to the street to protest Saturday. Several dozen people were there when FOX25 cameras were there, but protestors say over the course of the day hundreds of people came together in West Roxbury hoping their concerns will halt the latest proposed pipeline. A protest is held in West Roxbury on Saturday, April 23, 2016 against the West Roxbury lateral gas pipeline being built by Spectra Energy. Boston police arrested 15 people Thursday morning in West Roxbury during a protest against a high-pressure natural gas pipeline under construction on Washington Street. “Fifteen individuals entered the work zone and blocked an excavator from working,” said Boston Police Officer Stephen McNulty, a department spokesman. “There were multiple verbal commands issued to comply. About one-hundred activists gathered in West Roxbury on Saturday to protest a natural gas pipeline under construction there. The high-pressure pipeline would travel beneath three residential streets and near a quarry where regular blasting takes place. West Roxbury resident Bill Kessler says he’s worried about the potential for explosions along the new pipeline, and at a gas metering station on its route. A group of West Roxbury residents and students from Hampshire College and UMass Amherst briefly blocked construction of a trench up Washington Street for a high-pressure natural-gas pipeline this morning before they were cuffed, put in prisoner wagons and taken down to District E-5 for booking. Read more. Three West Roxbury residents were arrested Tuesday for protesting Spectra Energy’s construction of a natural gas pipeline in the neighborhood, police said. The protestors were taken into custody Tuesday morning by Boston Police officers. They were attempting to block construction of the pipeline on Washington Street, which is part of a 37-mile extension of the Algonquin Gas Transmission pipeline. Boston police on Tuesday arrested three people protesting the construction of a 5-mile-long natural gas pipeline in West Roxbury. Chuck Collins, the Rev. Martha Niebanck and the Rev. Anne Bancroft were detained as they protested on Washington Street alongside about a dozen other activists. Led by a band and carrying a 100-foot inflatable pipe, West Roxbury residents young and old joined together Sunday to protest the expansion of a high-pressure natural gas pipeline in the neighborhood. About 200 people, including several local government officials, attended the protest, held in the middle of Billings Field. DEDHAM – More than 200 protesters chanted, drummed, and marched along the proposed route of the controversial West Roxbury Lateral gas pipeline on Sunday afternoon. “Spectra is like a schoolyard bully,” Seamus Whelan, 53, of West Roxbury, referring to Spectra Energy Corp., told the crowd as it prepared to march. Updated on Thursday, June 18, at 10:10 a.m. According to Emily Kirkland of Better Future Project, Dedham Selectman Mike Butler was arrested this morning while protesting the construction of the pipeline. Early this morning, members of the newly formed Parkway Pipeline Prevention League marked out the route of a proposed high-pressure natural-gas pipeline along Grove Street in West Roxbury, then turned themselves into E-5 detectives for booking. Andree Zalesk, one of the pair of anti-pipeline taggers, writes: We marked the entire route with large stencils saying SPECTRA – the Texas company behind the project.